Short Attention Span: Obligatory Hair Fair 2014 Post! Part Three: So Many Hairs! Obligatory Hair Fair 2014 Post! Part Three: So Many Hairs! 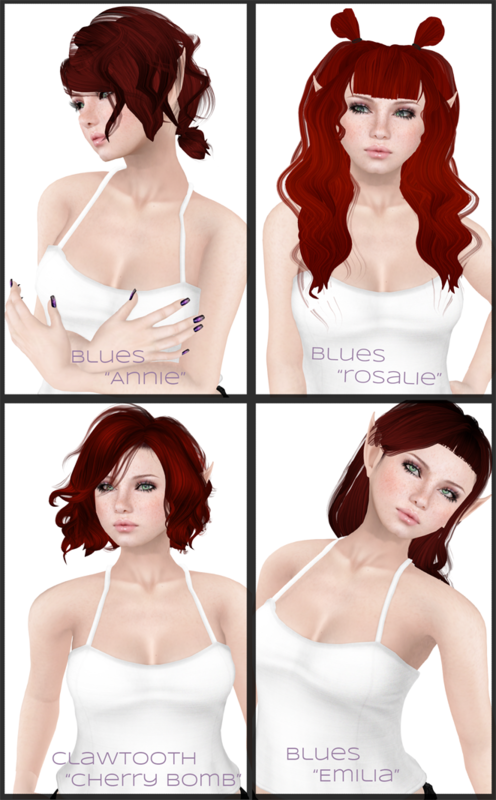 Blues - Annie: Blues made its shiny debut at this years Hair Fair. With the same owner as Okkbye, whose fresh-faced cosmetic items I am a fan of, Blues hair has a very cute, natural, easy-to-wear feel about it, realistically messy and casual. This first hair, Annie, with its little tiny ponytail, makes me feel a bit like Jim Hawkins in Disney's Treasure Planet. This is a good thing. Blues - Rosalie: I'm a sucker for this kind of style, and for straight bangs. As is the fashion these days, Blues hairs come with the different colours on a HUD, and here I'm wearing one of the brighter reds included, as I felt befit the style more. Clawtooth - Cherry Bomb: I remember the first year Clawtooth was in Hair Fair, when Clawtooth was still super-obscure. It makes me feel kind of old. Cherry Bomb is a comfortable shirt wavy style with a short parting. It's nice. I should note that I always tint Clawtooth hairs. In my pictures seen here I'm actually wearing Red Eye Flight tinted a pale salmon colour. Blues - Emilia: This is my favourite of the Blues hairs I bought. I am completely in love with the awkward little straight-cut bangs it has. It's got a delightfully mid-90s feel to it. Clawtooth - Color Me Pretty: This is the kind of hair Clawtooth does best, lush, thick-looking, long wavy styles. Can never have enough lush, thick-looking long wavy styles from Clawtooth. Lamb - Nothing: This is a versatile short style by Lamb, who I bought a few styles from this year. A nice thing about this hair is that the shorter part can be either removed for a part-shaved look, or even coloured differently from the rest of the hair as I have done here. It could also probably be worn on its own but I fear that would look silly. Lamb - Sacred: This is a classic Lamb style, I think I have an old version or something very similar in sculpt. I'm very happy to have a mesh version of it, because I completely dig this. Lamb - Dream On: I am as much a sucked for a good twin braid style as I am piggie buns. I love how these have a slightly wonky aspect to them, they put me in mind of my own somewhat sideways attempts at doing anything at all with my hair in RL.